Beach fashion is growing by the day and into an elaborate line up so much so that today we see major Fashion Weeks that specifically revolve around this genre of fashion and need based clothing. Highly dominated by comfortable fabrics, luxurious, vibrant and statement making prints and free flowing and easy silhouettes, it is these characters that define the mood of this type of clothing. Talking of mood, a fashion idea is never aptly justified till you depict the message from head to toe and in this case it refers to the fact that not just clothes but everything else that contributes to a complete fashion look are as important the clothes. The style of the hair has a huge role to play to set the fashion mood right and like everything else beach fashion too has its favored ones. Feminine and innocent in character, the boho braid oozes of a stylishly messy free spirit. Braid hairstyle not only adds an element of cute to the attire but comfortably keeps the hair in place avoiding entangling. This hairstyle forms another soft addition to the beach fashion and accessories only perfect it. Curls and waves untamed character is what associates them to an easy going nature hence, easily establishing the style into a popular choice with beach wear. Floral hair clips adorning the style perfectly is one way to go and layering and stacking neckpieces with curls left loose is the other form of styling the beach look and getting it right. This element of nature has forever inspired every fashion generation that has existed and ceases to lose its charm. The flower has been translated into endless forms and for the Spring Summer 2012 it forms a perfect hair accessory and will continue to do so, just like it always has. A pretty natural form and the color that it adds to the hairstyle is what makes it a favored pick and effortlessly adds a touch of drama to the look which is welcomed when it comes to beach wear and fashion. Feathers have been huge in the past few fashion seasons. The decorative and protective feature of the birds has become a huge fashion craze and has also been spotted in the form of jewelry. 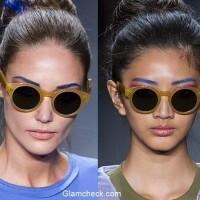 Spring Summer 2012, however, directs the fashion element to a detour making it the edgy hair accessory for the season. Perfectly fitting in the idea of tropics and florals, this element does justice to the theme too. A holiday favorite, this accessory too does a lot to your look. Keeping the hair away from your face and protected too, the hair accessory is very bohemian in nature. This season it is the printed ones that form the trend. Style these over the side braids or the flowing curls to suit your beach wear. 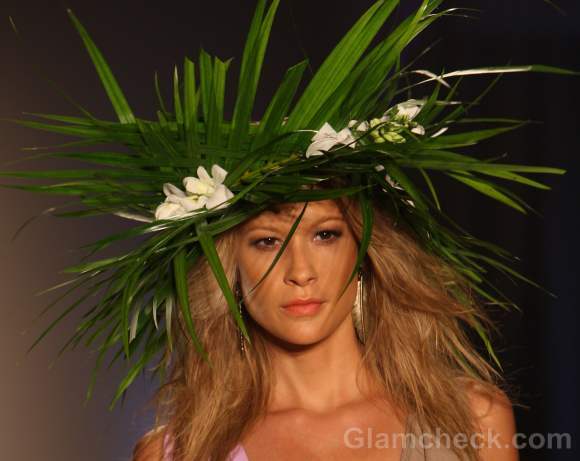 Be it leaves woven headgear or a straw hat , the source is natural and very much part of Spring Summer 2012. Dramatic leaves woven headgear has a deep green color of the leaves and lined by pretty flowers is as natural as it can get. The inspiration is truly Hawaiian in nature and will be loved. On the other hand, straw hat pretty much is a classic accessory and holds its position even this year. Whatever, be the style, there definitely is one clarity, that beach fashion and its accessories are truly and completely inspired by nature and the freshness is incorporated as much as possible to be part of the aesthetics.